As title, recently got a new Sony xf90 55 inch TV. Picture is excellent but after initial setup was surprised to find ITV hub and all4 failed with various error messages. Did a factory reset and they finally started working. However I then took delivery of an external HDD to use for recording programs. Pressed the red record button and nothing happened. Investigated the youview menu and after a while was totally gobsmacked to find that in youview mode, recording to external devices does not work! What a mess! I had been using an external Bush Freeview play zapper box with my old Panasonic TV and happily recording with that (box was £45 from eBay!). I very nearly returned the Sony TV and replaced it with an lg, but decided not to because, in my experience with electronics, virtually no consumer devices do all that you want. I have got another zapper box to regain proper recording functionality but that is pathetic, to have to buy a £45 external box to supplement a £1000 TV. I am very disappointed about youview on Sony and imo it is not a patch on Freeview play. Sony's implementation has too many limitations (or maybe it is youview and not Sony's fault). As well as losing ALL recording functionality in youview mode, you lose access to all satellite channels. Finally, Freeview play is a smoother implementation. Oh well ... If you have been, thanks for reading! Commenting on my own post, for those who say I should have checked on ability to record, I thought recording and pausing live TV was so fundamental that it seemed obvious it would work. Obviously not!! Greetings, @radiomean and welcome to the forum! I can’t believe you missed the recording caveat. I mean, good Lord, here it is on this Sony page, in a footnote that you only have to open specially, and the footnote is clearly referred to, in at least one-point type, if not something bigger. Surely you can’t have missed the 14 on this page? 14. HDD recording (REC) and Satellite features are not available if YouView functionality is enabled. So Sony have fulfilled their legal obligations; their moral obligations perhaps demand a bigger font and a more prominent notification. But what can you do about this? Well, you can switch to the Freeview side of your set, as here, Android-Specific FAQ 1. Then you can record, and you can also tune satellite channels. You will lose the itv Hub and All4 Players, though you can Google ‘Hoshsadiq’ and find a techie fix for this, if it matters to you. I’m still a bit confused by your ‘zapper boxes’ though; we usually use this to mean boxes that can tune but not record, so I’m not clear how you used one to record with. I’m also not clear why you had to buy a second one, even if you didn’t know how to switch the TV over to the Freeview side that can record anyway? But do let us know how you get on with the above. And YouView can always fix this by rolling out the recording functionality on these Sony TVs at last. Can’t they? Argos's Bush Freeeview Play Zapper box, (FVPZAPPER100), is manufactured by Vestel for Argos. It is a 'PVR Ready' receiver. It is not the only PVR Ready receiver currently on the market. E.g. There is also Humax's satellite HB-1100S receiver. Yes, neither of those models contain an internal hard drive from which to record, hence why they are called zapper boxes. But they can be linked to an external recorder to do so. Yes the Argos Bush zapper box plus a usb stick is an elegant and very cheap solution. (£50). Sony don't have a licence for ITV Hub or All4. Nor do they have a licence for Freesat or Freeview, either. YouView does, but as you say doesn't come with recording facilities. Not that I'd ever recommend a TV over a box for recordings anyway as they are far too limited. 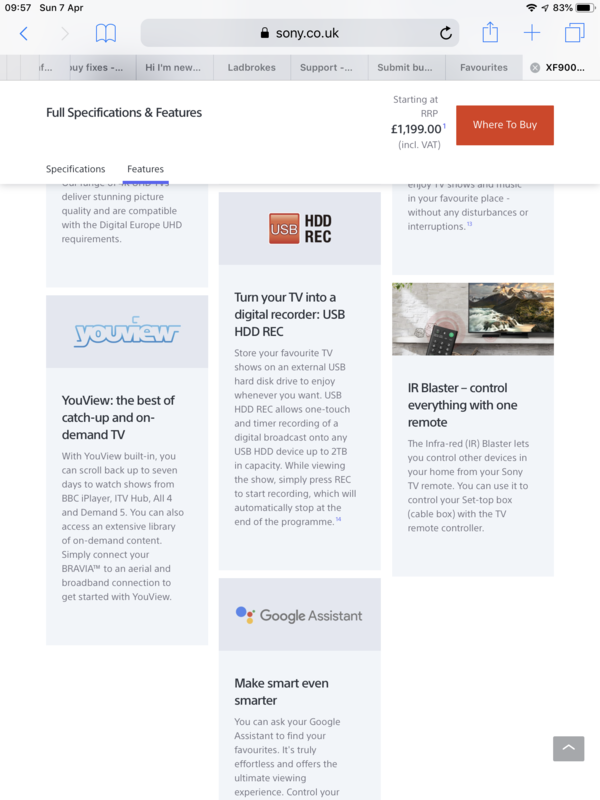 No licence for Freeview? I wonder who does their EPG, then? As well as their Android TV sets, Sony offer Freeview Play sets as well. With the backward EPG, all the big 4 Players, USB HDD recording, and no sneaky footnotes. Maybe it is not too late to swap? Re itv hub and all4, I assume you can sideload them? Which models are equivalent to the xf90 55 inch? I’ll let you do your own feature for feature comparison, if you are interested, though I think Sony throw most of their tech at the Android sets (thus spoiling great TVs with a tragic OS) and the FreeView Play ones are a bit second string. But maybe not any more, if Sony have realised how much business they are losing through this. Competition and market forces, as you say, and maybe these will win through. Surely the xf70 series are older and less well specified than the xf90? The Date First Available on Amazon is often indicative - June 2018 for the XF70, November for the XF90. So both 2018 sets; the year usually matters more than the month. As to how well specified, I have given you links to both, and the Sony site makes comparison easy; do let us know what you discover from this. I don’t know if it is Android per se, or Sony’s implementation of it, or the arguably under-specified hardware Sony are running it on; but spend some time on the relevant Sony forum - there is a dedicated AndroidTV section - taking particular note of what Kuschelmonschter has to say. Then be aware that AndroidTV isn’t quite Android, as anyone who has tried to load their favourite Android app, and not found it in the AndroidTV store has found. Finally, going right back to your original beef, consider why YouView has never reached its full potential on these sets, and has rather stalled in a half-implemented state.